A scene captured from the Portuguese village of Campinho in the Dark Sky Alqueva Reserve shows a partially eclipsed moon, Mars and the Milky Way with a flare from the Formosat-2 satellite crossing the center of the picture. The bright planet Jupiter is also visible on the right edge. Miguel Claro is a professional photographer, author and science communicator based in Lisbon, Portugal, who creates spectacular images of the night sky. As a European Southern Observatory photo ambassador, a member of The World At Night and the official astrophotographer of the Dark Sky Alqueva Reserve, he specializes in astronomical skyscapes that connect Earth and the night sky. Join him here as he takes us through his photograph "An Eclipsed Moon with Mars, Milky Way with Saturn, and a Satellite near Jupiter." Captured 15 minutes after the end of totality during the longest total lunar eclipse of the century, this scene shows the red glow of a partially eclipsed moon very close to Mars. Not far from this satellite flare is the planet Jupiter, which glows brightly near the right edge of this wide-angle view. This single shot was captured from the town of Campinho in Portugal's Dark Sky Alqueva Reserve. Editor's note: If you captured an amazing astronomy photo and would like to share it with Space.com for a story or gallery, send images and comments to managing editor Tariq Malik at spacephotos@space.com. 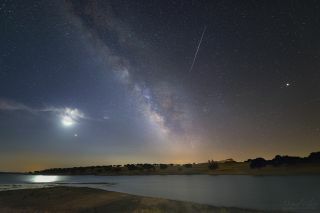 To see more of Claro's amazing astrophotography, visit his website, miguelclaro.com. Follow us @Spacedotcom, Facebook and Google+. Original article on Space.com.